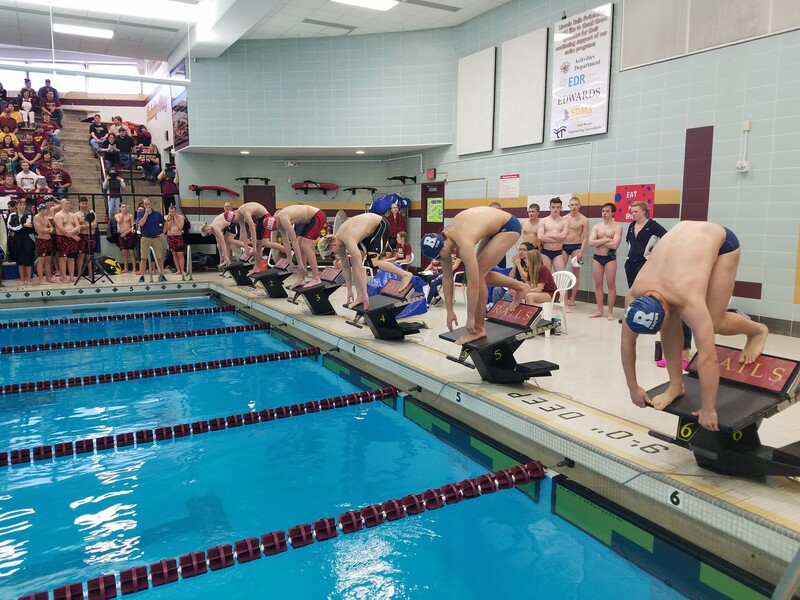 The Rails hosted the CIML Metro Conference Championship meet this past Saturday (1/20) where all the teams from the Metro came together to race for medals and personal best times. The Rails were excited to hit the water Saturday. After winning their first conference championship meet last year, the team was hoping for a repeat. While they came up just a little short (13 points is all! ), the guys had impressive races right from the start, with the JV “A” and “B” Medley Relays dropping over 9 seconds each. From there, the fast times continued until the very last event, when the Rails won the Varsity 400 Free Relay in an untapered best time – 3:26.20! By the end, the Rails had earned 17 individual podium spots, with multiple Rails on the podium in six of the eight individual events. Plus, the Rails won two of the three relays. We also awarded five Sub Club shirts! The majority of the Rails were fully tapered for the Conference Championship Meet, making it their last meet of the season. The meet highlights below will focus on those swimmers. Districts limits the number of entries into the meet (ex: only one relay per team). Great job guys! Rails JV Medleys each dropped nine seconds! Rails Varsity Medley (McCollough, Slycord, Santiago, Neifert) took 4th and dropped 1.20 seconds! Konnor Klocke won the 200 Free with a 1:54.46 (-2.75 seconds, PB time). Plus – Espinoza and Worthington took 3rd and 7th! Gabe McCollough dropped 1.33 seconds to a 1:02.70 taking 6th by .02 of a second! Rails Varsity 100 Free swimmers took 3rd (Clark), 6th (Bennett) and 8th (Neifert)! The Varsity 500 swimmers took 2nd, 3rd and 6th! Nice swims Espinoza, McCollough, Worthington! JV Sprint Relays took 1st, 2nd and 7th! Alec Kessler swam a PB time of 1:18 in the JV 100 Back and took 5th! Javier Santiago won the varsity 100 Back in a 57.13! Griffin McCollough moved up to take 6th overall! In the JV 400 Free Relay took 1st, 5th and 7th! Below are some photos from the meet. Be sure to check out the team’s photo website (link in the upper corner or under Photo Sites Archive) to view tons more.